I catch these glimpses of strong-willed, brave, passionate women and it is undeniably moving. True Femininity is a beautiful and gravitational force. It’s enigmatic, hard to put into words, but when I see it, my heart leaps up. The feminine concept has had a tough go. More often, it is either shrouded in cheap gaudy imitations, poisoned with reactionary fist shaking, or reduced to an impossible list of Martha-Stewarty perfection that no one can attain. Lost in the cacophony of voices telling us what it means to be a woman, most of us get the vague sense that we aren’t doing it right, somehow simultaneously not enough, and too much. And in the hiding and striving, we’ve lost a core part of our identity. I feel the call- the invitation to release my tight fists, grasping at who I think I’m supposed to be- to open my palms and receive an identity He has for me. 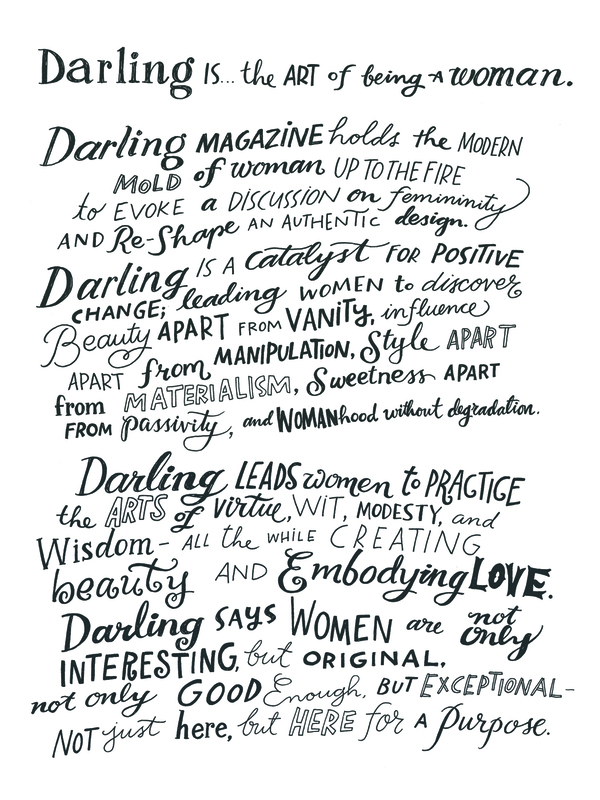 Darling is a catalyst for positive change, leading women to discover beauty apart from vanity, influence apart from manipulation, style apart from materialism, sweetness apart from passivity, and womanhood without degradation. Darling leads women to practice the arts of virtue, wit, modesty, and wisdom— all the while creating beauty and embodying love. Darling says women are not only interesting, but original, not only good enough, but exceptional, not just here, but here for a purpose. The long scrutiny in the mirror. A staring contest with my reflection in the mirror, brows furrowed and ending in a big sigh. It’s astounding how much my confidence, my mood and the trajectory of my day is based on how I feel about my reflection in the morning. If I feel like I’m having a good hair day, or like the way my outfit looks, it’s a much better day. On the one hand, I am annoyed at this shallow thought process. Why am I allowing external and fleeting circumstance to dictate my self image? Why do I care so much? Surely more “holy” women didn’t waste their time on such frivolities. And yet… there is a still voice inside that is insistent: beauty Matters. We do not live in a universe with an infrastructure of sterile functionality, but rather an extravagant symphony of complex artistry. As a reflection of the Creator, we have the impulse to create; a human desire that has been playing out in a myriad of ways since the beginning of time. I’ll admit, something in me delights in wearing red lipstick, or the feeling of a silky dress on my legs. I’m not doing this as a peacock, a vain attempt to be noticed or applauded. There’s just something that delights my soul in creating beauty, whether it’s on a blank canvas, arranging food on my plate, or getting dressed for the day. The snare is in thinking that beauty is solely an outward affair. Something to put on. To cover up and adorn so as to transform into something aesthetically pleasing for the purpose of outward approval and validation. I’m coming to discover the reverse to be the case. Beauty indwells every woman. Coming to Know our own beauty- to claim it and reveal it in our own way is a life long process. One that we must embark on, taking the hands of our sisters along the way. Our Beauty is not up for the evaluation of others for validation. It exists already, as is. True beauty shines brightest from the illuminated souls of those who are deeply aware and quieted by the knowledge that they are enough. Celebrating it without needing it to be applauded. *This was a poem in a recent Darling Magazine– I didn’t write down the poet’s name, but LOVED it!